ATA Airlines, Inc., formerly known as American Trans Air, was an American low-cost scheduled service and charter airline based in Indianapolis, Indiana. ATA operated scheduled passenger flights throughout the US mainland and Hawaii, as well as military and commercial charter flights around the world. The airline maintained focus cities at Chicago Midway International Airport, Honolulu International Airport, and Oakland International Airport. The airline's parent company, New ATA Holdings, Inc. (the successor to ATA Holdings Inc. which was also once known as Amtran), recently changed its name to Global Aero Logistics, Inc. and purchased World Air Holdings, Inc. for $315 million in an all cash transaction with the financial backing of the investment firm, MatlinPatterson. World Air Holdings, Inc. owns and operates North American Airlines and World Airways as two separate US-certified air carriers. ATA was North America's largest charter airline, and until its shutdown transported more troops for the United States Military than any other commercial airline. On April 2, 2008, ATA filed for Chapter 11 bankruptcy protection. ATA then announced it was ceasing all services, effective 4:00 AM EDT, Thursday April 3, 2008, citing the unexpected loss of a major contract for its military charter business, as a subcontractor of FedEx Express, along with recent increases in jet fuel prices. Red-eye flights in the air at the time of the announcement proceeded to their destinations. Flight 4586 from Honolulu to Phoenix was the last ATA flight, departing almost 2 hours late at 12:10am (HST) arriving April 3, 2008 at 8:48am (MST). Southwest Airlines owns and retains all ownership of the operating certificate and all assets held by ATA Airlines including trademarks, logos, etc. These were purchased for $7.5 million by Southwest while ATA was operating under bankruptcy protection. On October 26, 2004, ATA Holdings and its subsidiaries filed for Chapter 11 bankruptcy protection. Eventually, shareholders of ATA Holdings stock lost all their money and received no shares. The stock, previously traded on the Nasdaq stock exchange as "ATAH", was delisted. In 2004, AirTran Airways agreed to pay $90 million for ATA's 14 gates at Chicago-Midway. Southwest made a higher bid and AirTran's deal fell apart. In December 2004, ATA entered into an agreement with Southwest Airlines to transfer six gates at Chicago Midway International Airport and 27% of non-voting stock in exchange for a cash influx and codeshare agreement. In the beginning of 2005, the airline drastically reduced flights at its Indianapolis hub to only three destinations and centered scheduled flights at Chicago Midway International Airport in order to complement Southwest Airlines codeshare flights. ATA also focused on serving markets that are business oriented and do not have Southwest service, such as San Francisco, Dallas/Fort Worth, and New York–LaGuardia. Additionally, ATA began offering point-to-point service not connecting to its Midway Hub, as to benefit other Southwest Airlines focus cities, such as Las Vegas, Orlando, and Phoenix, with connections to non-Southwest destinations such as Denver and Hawaii. Southwest CEO, Gary Kelly, said that revenues were up nearly 20% due to the new codesharing agreement. On March 28, 2005, ATA shut down its commuter airline service, Chicago Express/ATA Connection, and later sold the assets to a private buyer. In attempt to reduce operating costs, the airline also downsized its fleet by returning twenty Boeing 737-800 and eight Boeing 757-300 aircraft, along with numerous Boeing 757-200 aircraft. The eight 757-300 airframes were subsequently refurbished by Boeing, the lessor, and then leased to Continental Airlines. In mid-2005, ATA entered an agreement to lease three ex-United Airlines Boeing 737-300 aircraft. Three 737-300s entered service with ATA in late November 2005. Due to high lease rates, the three 737-300s were taken out of service in November 2007, and returned to their owners. In September 2005, ATA outsourced all its Heavy Maintenance Checks to overseas and domestic contractors. Also planned was an agreement with Continental Airlines to trade ATA's remaining four 757-300 aircraft for four 737-700 aircraft. In early October 2005, ATA terminated these negotiations due to the Boeing machinists strike, which would delay the delivery of the aircraft. On October 13, 2005, ATA announced major service reductions, ending flights to Boston, Minneapolis/St. Paul, and Newark. In addition, the planned addition of flights to Miami and Sarasota, Florida was cancelled. This ended Southwest codeshare service to Minneapolis and Newark. Later that year, on November 1, 2005, a second round of flight cuts were announced, including the suspension of scheduled service to Denver, San Juan, and their headquarters and former hub Indianapolis. On November 17, 2005, ATA Airlines received court approval to sell its Ambassadair Travel Club division to Grueninger Cruises and Tours. In a third round of cuts announced on December 6, 2005, ATA announced that it would discontinue service to three additional cities. ATA would suspend flights from Chicago Midway International Airport to San Francisco, Orlando, and Fort Myers in late April 2006. Following these cancellations, ATA would have only 18 daily scheduled departures from its former Chicago hub and 52 scheduled departures company-wide. Moreover, the company would be left with only 1 gate at Midway, down from its previous total of 14, surrendering the balance to Southwest or the city. On December 15, 2005, ATA announced an expansion of its code-share agreement with Southwest Airlines. ATA Airlines would expand codesharing with Southwest Airlines between Dallas-Fort Worth International Airport and cities in the Southwest system that connect via Chicago Midway International Airport. In January 2006, MatlinPatterson and certain pre-bankruptcy creditors invested over $100 million in ATA and took the company private, also taking over ATA Holdings, Inc. 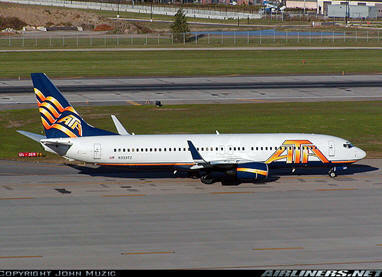 Following the transaction, on February 28, 2006, ATA Airlines emerged from Chapter 11 bankruptcy protection. However, the airline was still shrinking. ATA continued to return more aircraft, including the 1,500th Boeing 737 Next Generation produced, N333TZ, which was delivered new to ATA on May 14, 2004. Following its first emergence from Chapter 11 protection ATA made several efforts to return to profitability, but due to the rising cost of fuel and negative pressures on ticket price ATA was unable to recover and ended operations on April 2, 2008.